Spring is one of the best times to visit Norfolk. 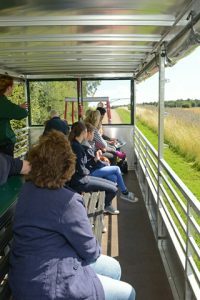 With the days getting longer, the sun stronger and a number of bank holidays on the way, May really is a fantastic month to get out and explore the Broads and the surrounding area. If you’re heading to Norfolk for the May bank holiday weekend and are looking for a fun day out, here’s our pick of the very best activities the county has to offer. Though we may be biased, in our opinion there are few better ways to spend a day out in Norfolk than on the water. 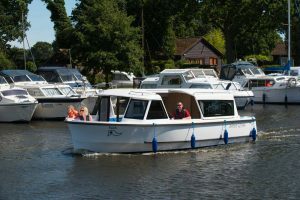 Arranging day boat hire for your trip to the Broads is easy. Once you’ve found the perfect vessel, all you need to do is round up your friends and family, pack a picnic and head out to explore the region’s labyrinthine waterways. View our Day Boats. If you’d rather keep your feet on dry land, why not hire a bike and explore the countryside on two wheels? Bike hire is readily available in towns and tourist centres across the county and Norfolk has a fantastic choice of clearly signposted bike paths to choose from. Plan your route to take you past a country pub and enjoy a meal out at one of the county’s excellent eateries. Check out some of the most popular Norfolk Broads Cycle routes. 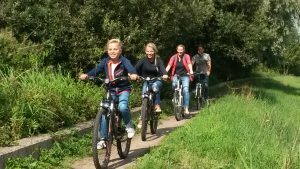 We recommend Broadland Cycle Hire for your two-wheeled adventure. Norfolk is lucky enough to boast a number of the UK’s best beaches. If the weather’s playing ball, why not head to Old Hunstanton, Sheringham or Sea Palling Beach for a paddle? 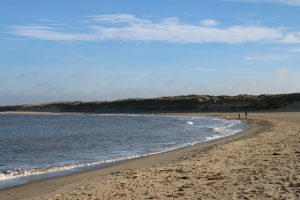 Walking routes can be found around most of the county’s beaches or you can visit a nearby café and warm up with a hot drink. If the weather forecast isn’t looking great, head to the craft fair in Bircham Windmill this bank holiday. Taking place from 30thApril to 1st May, the fair is a fantastic opportunity to see some of Norfolk’s outstanding regional products and pick up some unique souvenirs. The Field to Fork Tractor Trailer Tour is a great way to learn all about food production in Norfolk. Taking place at Holkham Hall, the tour takes visitors around the expansive Holkham Park to see the seasonal fruit and veg being produced. 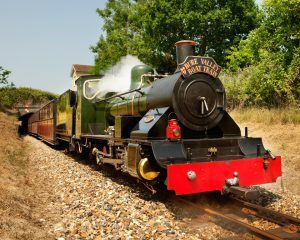 One of the most popular attractions in Norfolk, the Bure Valley Railway is a great choice for a bank holiday day out. Steam trains will be running throughout the late morning and early afternoon, giving you the chance to explore the region and see some of Norfolk’s most beautiful countryside. Book your ticket in advance to avoid disappointment. For more ideas on things to do in Norfolk, or to arrange your one-day boat hire, contact a member of our team today.